Our 200ml Lily of the Valley Perfume Diffuser allows you to experience this sensational natural fragrance in your home for longer. Elegantly designed, this stylish diffuser gradually disperses the exquisite pure scent into the room for a mesmerising, long-lasting aroma that lifts your mood. Lily of the valley—a fresh, sweet, and delicate floral scent—makes the perfect, light background for a wonderful and relaxing home environment. This well-loved little plant, with its romanticised creamy white flowers, boasts a fragrance that is innocent, charming, virtuous, and as optimistic as the spring. Prized not only for its exquisite scent, lily of the valley is well-known for its perceived abilities to work on the mind. This powerful scent is used in aromatherapy to treat depression, relieve headaches, and generally improve the brain’s cognitive processes. 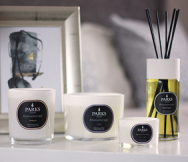 Its soft, reassuring scent is immediately comforting, balanced, and familiar—with an air of tranquillity that will instantly bring harmony to your living space. Unlike many air fresheners and fragrancers on the market, this captivating fragrance uses only botanical ingredients, with no harmful toxins or chemicals added. High levels of pure scentss are carefully blended with an alcohol-free base to ensure that the perfume fully scents your room with its delightful bouquet. Featuring a classic neutral lid and natural rattan sticks, this stylish room diffuser makes an attractive addition to any home environment, with a design that will suit all tastes and styles. Packaged in a smart, modern gift container featuring the iconic Parks branding, this delightful item makes a beautiful, thoughtful gift for a discerning friend or family member.